I could write entire blogs about each of these visions but I will be brief and let the vision art I am creating do a lot of the talking. It was long day of prepping for the big 11.11.11 Ascension Convention event. Exhausted, I stagger to my room at the Grand Vista hotel near Rancho De Las Palma, the event site, tear back the covers and collapse into bed without even the energy to brush my teeth. I am instantly in that semi-conscious state that often leads to visions. Soon my spirit leaves my fatigued body and I ascend above the Simi Valley. But the air is not normal. Rather it is like a great faceted diamond, pancaked from horizon to horizon. My higher self tells me that these fractals in the atmosphere are all different universes where I exist in many pieces and places. One universe, where for example, I am still married, another where I am still an architect, and so on, one universe for every possible choice I’d ever made or the world made for me. My higher self now says it is time to unite all my divided selves. So I hold forth my hands and begin to will all my countless selves into this one vessel. Slowly at first, but with a growing speed that dazzles me, billions of my other selves start to integrate into one ascended self. As the amazing process continues at exhilarating speeds that are indescribable, the sky fractals become less and less until the sky is one and so am I! Knowing I am done, my spirit flys back to my meditating body in the Grand Vista hotel and I fall blissfully asleep, excited for the magic that awaits me on 11.11.11. That’s a beautiful vision and artwork. I can really see what you saw in that brief description. 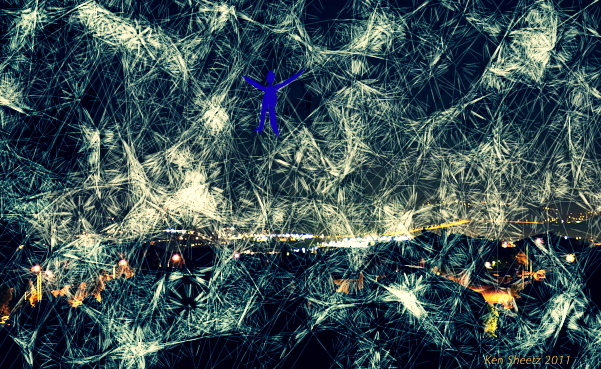 The lights of the roadways below, behind the web of consciousness.